A long long time ago (November 2015, according to ravelry), I finished knitting a cardigan. I won’t get into the hassle actually knitting this cardigan was (gauge issues, anyone? 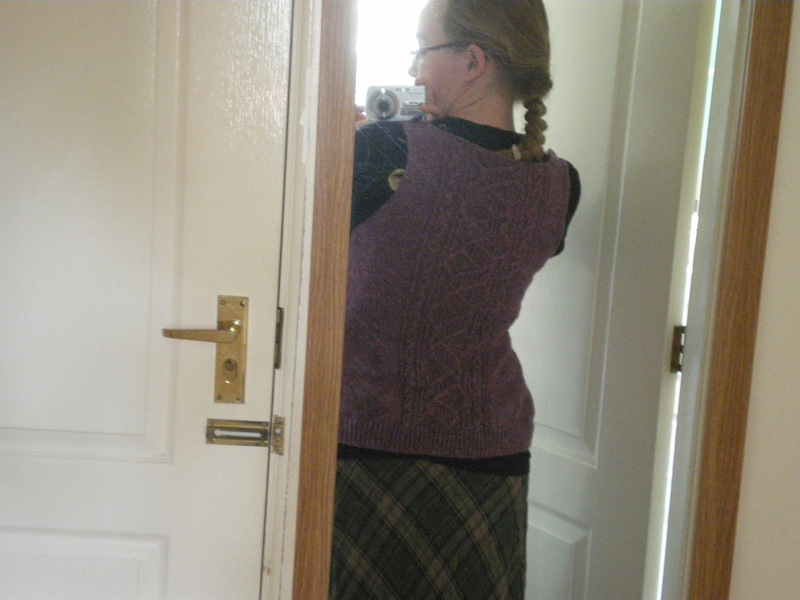 ), but it was a lovely cardigan, and I loved wearing it (but I need to make future cardigans longer in both the body and arm). Ahem. Anyway. 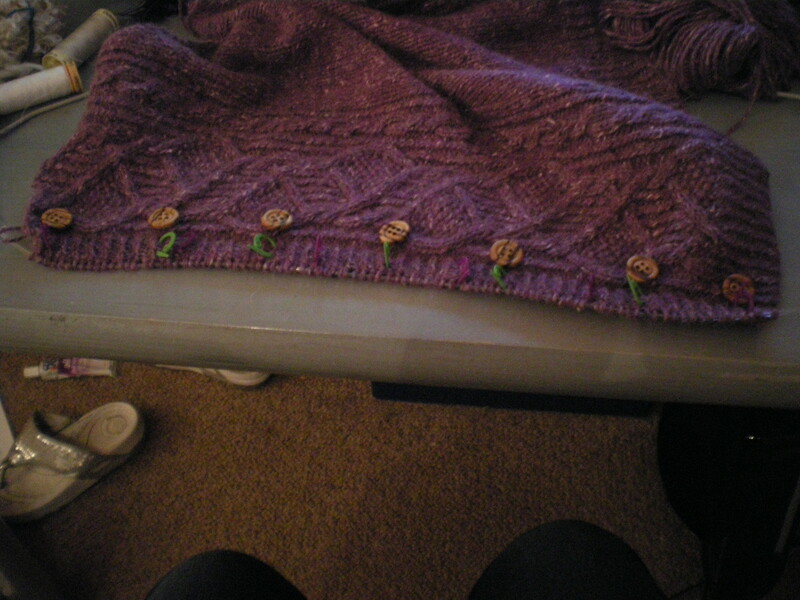 So, one lovely cardigan, getting quite a lot of wear. 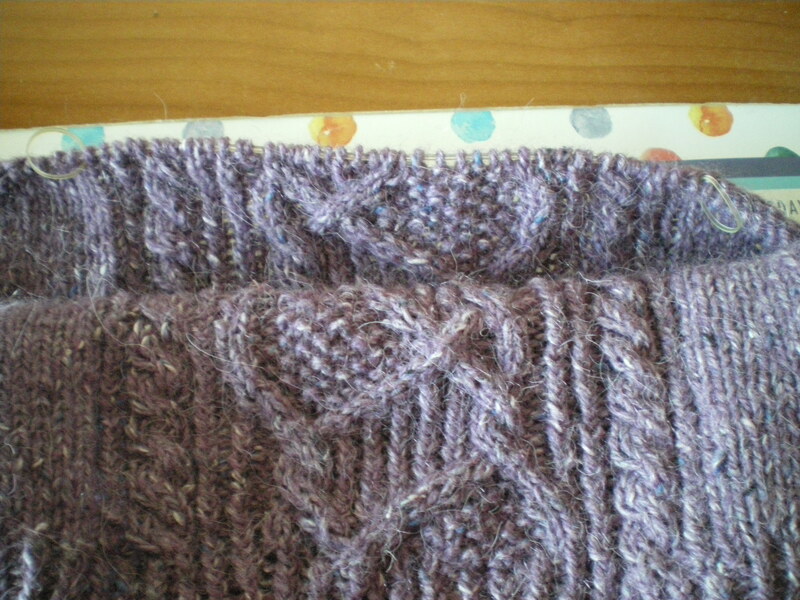 And you can also see that the button bands really need reknitting (and the buttons resewing). So when the collar ribbing tore, I put it aside to repair, and I finally got around to repairing it the other day. Tore out the collar and buttonhole buttonband. I left the other button band, but the buttons were removed. Fixed! Well, apart from the fact that I can’t duplicate stitch purl and ended up with an extra knit stitch, but that’s hardly a problem! And this yarn isn’t colourfast, so the new work is a different shade of purple to everything, but oh well! That won’t be a problem after I wash it the first time! This cardigan has been in the works for quite a while. I started it over a year ago (June 28th, according to ravelry!). 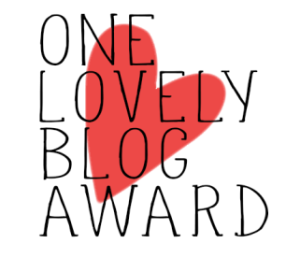 The first blog post about it was July 5th. I’ve had ups and downs with it (remember when my sleeves were different sizes?). But it all came out right in the wash (and block). 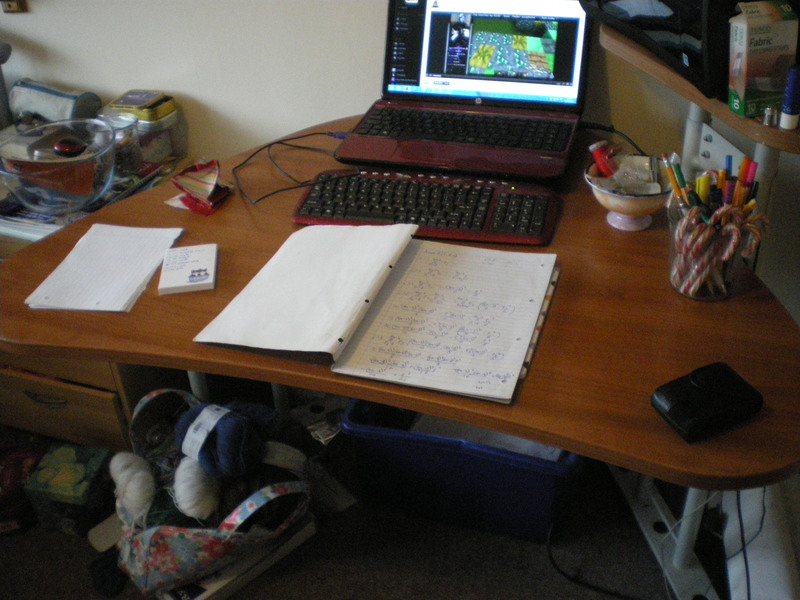 I asked peoples opinion on the number of buttons (and then promptly changed my mind and decided on 8 :P). And…now it’s finished. When going on a yarn crawl, take the thing you need buttons for! Holy wowsas I look good in fitted cardigans! 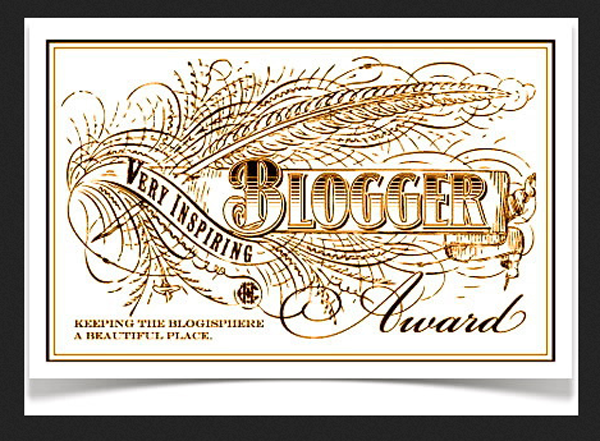 I think I need to have a lie down now while I figure out what to do with the rest of my life! Instead of picking up 95 stitches, it became a case of picking up 12 (and one part of 11) stitches between each of the stitch markers! I also went and got some buttons, what do you think? I got 7 (without reading how many the pattern suggested), and having tried 6 and 7, I decided that 8 would be a good number. So I went out and got another 2 (so I have a spare). I can’t believe how nearly finished it is now! …is that the sleeves are actually fine! 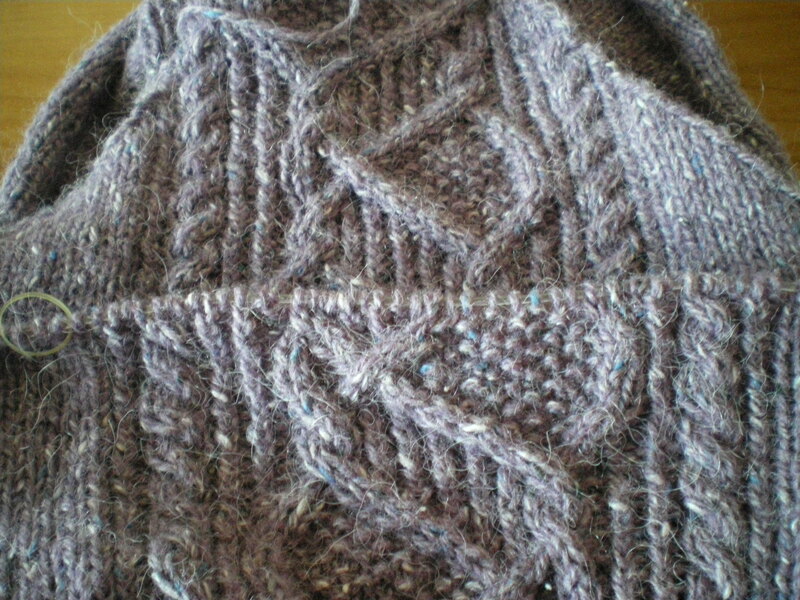 I finally got around to blocking the damn thing today, and the sleeves block out to the right size!!! 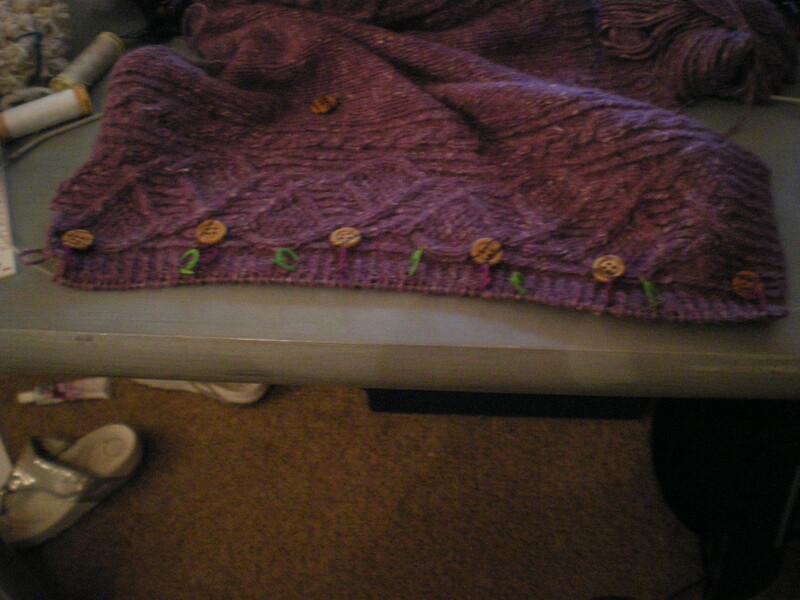 Next step: ribbing the buttonbands and collar, and sewing it all together. Woot! So, this cardigan has been in the works for a while. I bought the yarn back in December 2013. I was a first year PhD student going back to Plymouth to collect some things from my ex, and since there was a rather good yarn shop, I stopped in a bought 2 sweaters worth of yarn. I duly swatched, and cast on for my sleeves, in case my swatch was lying to me (they usually do, but whatever is going on with this cardigan, it’s a darn sight more interesting than a simple lie.) I started my first sleeve last July, almost a year ago now. After finishing both sleeves, I realised that something really dodgy was going on with my gauge. The first sleeve was too small, but the second one was fine, so I just decided to ignore it for the time being, and get on with the body. 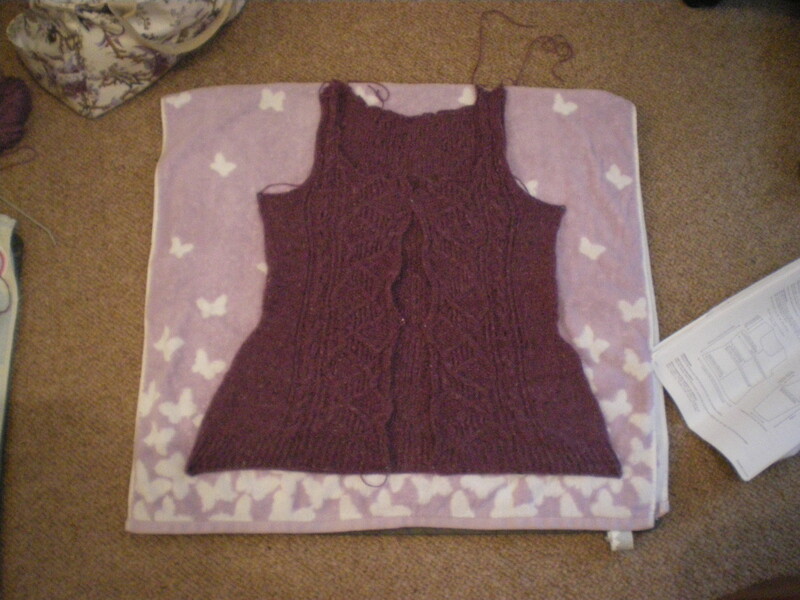 I decided to knit the body all in one piece, rather than doing the back and two sides separately, and then seaming. Well, I have good news and bad news. 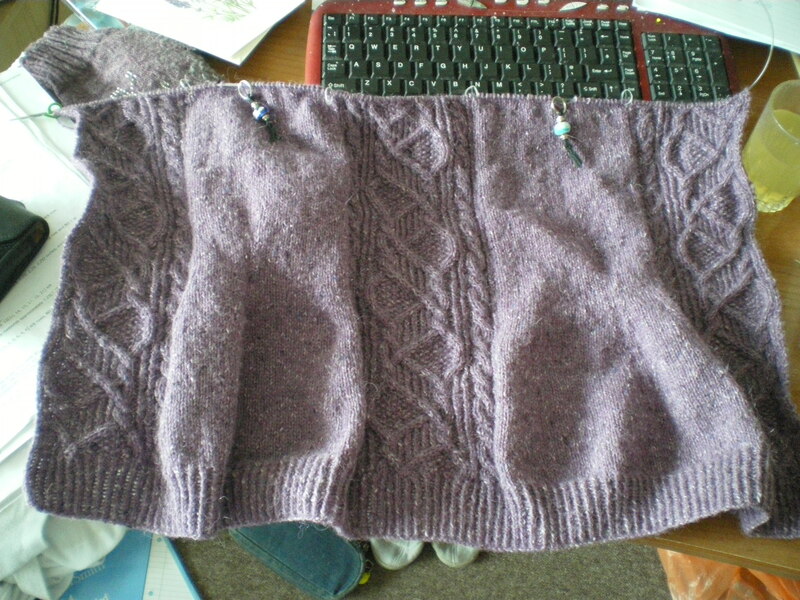 The body of the cardigan is finished. I haven’t blocked it yet or anything (the sleeves are attached by safety pins), which is the good news. It’s very fitted, but I’m hoping to gain some ease with blocking. 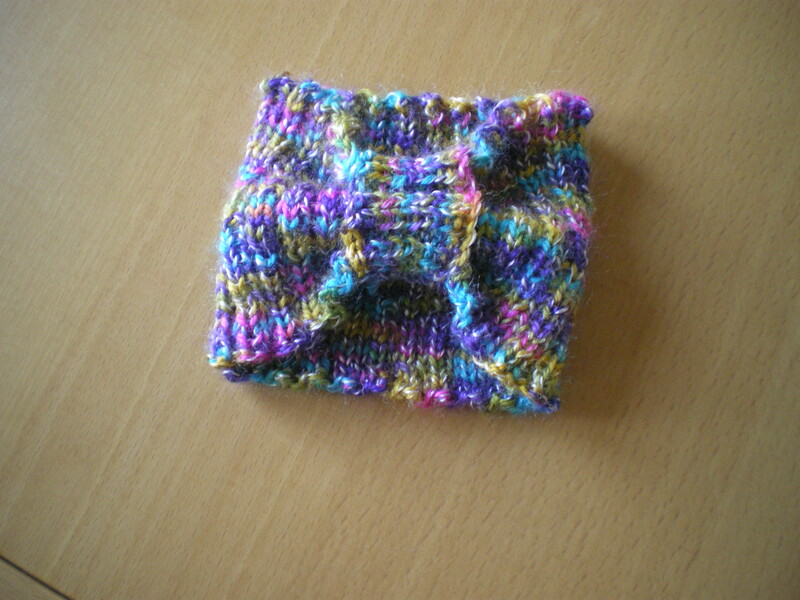 And it’s wool, I won’t need layers on underneath! 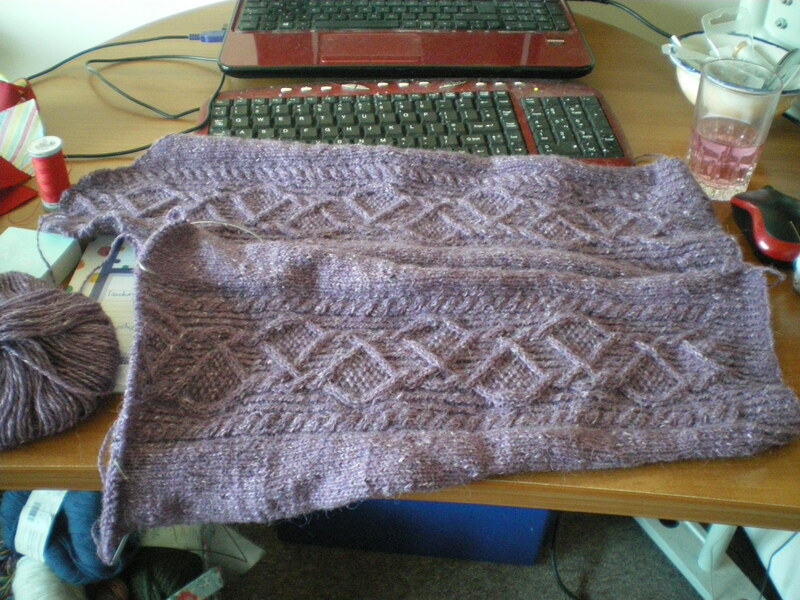 And then, I got back on with making another sleeve. I found the right chart, and started knitting. The stopped, looked at what I was making, and at the sleeves. 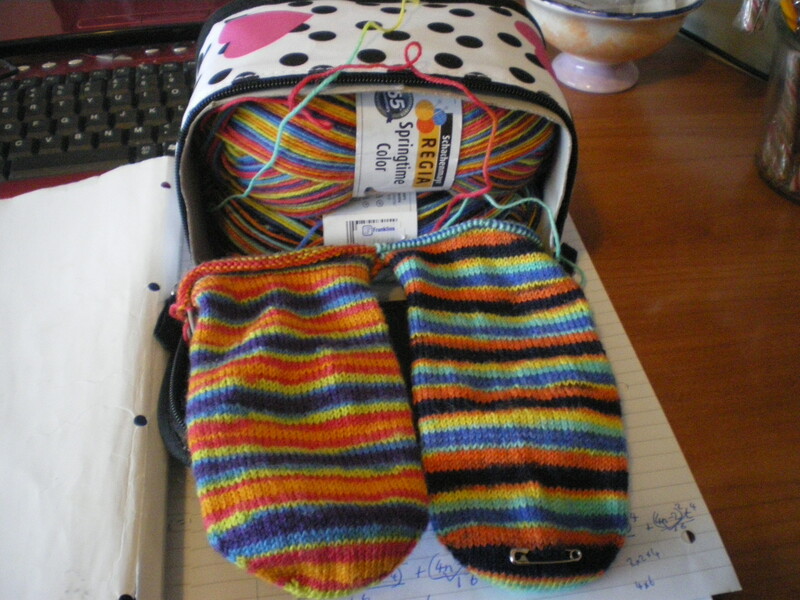 Knitted a bit more, and looked a bit more. Decided to check that this was going to work, and lined everything up. Nope. Not going to work. Not one little bit. But anyway. Back to the main problem. 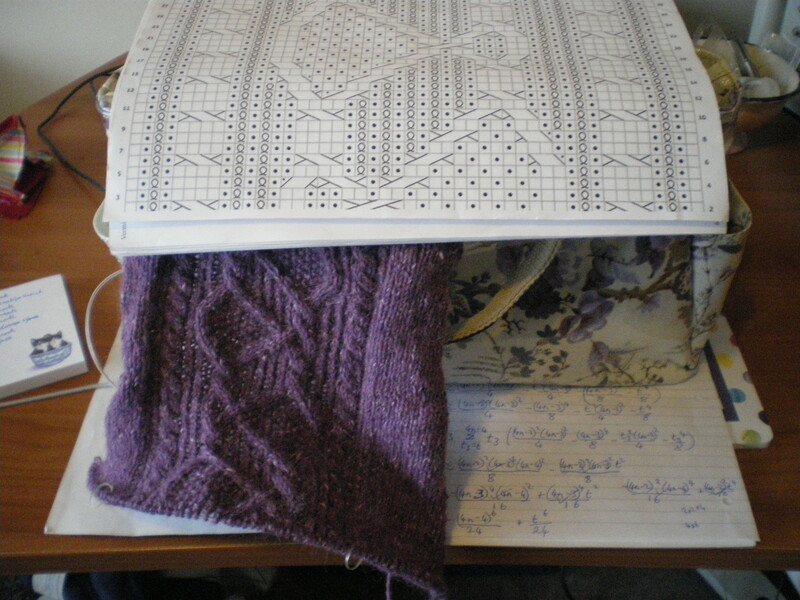 My plan is to block everything (including the sleeve currently on the needles), and then figure out what needs doing. Unfortunately, that means I need to wait until September because the blocking mats are in Uni and I can’t get hold of them until then. *sigh* I guess I should get on with Christmas presents until then! 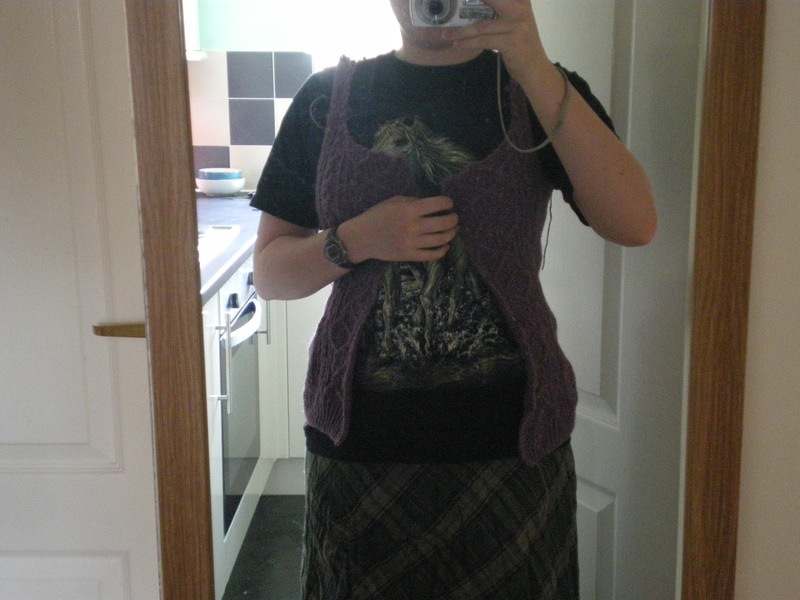 Okay, so I mentioned in my last post that the cardigan has had some gauge issues. Well, more than that, it’s had a rather checkered history all over! According to ravelry, I started this in June last year. Wow! I first mentioned it on here in July, when I was at a conference in Warwick. It then got put on hold, first for Christmas presents, and then my November sweater. (I figured that I would be hard pressed to get all the cables done in a month! 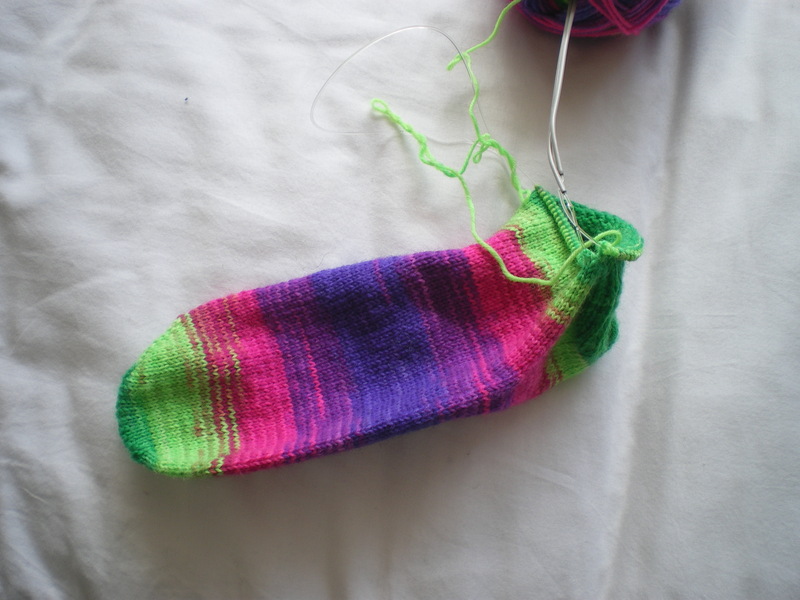 And then the seaming…). 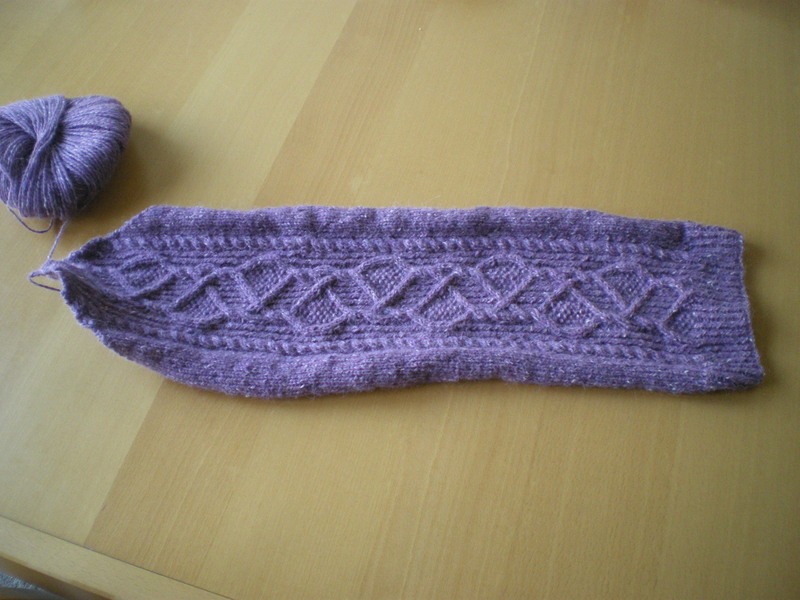 And then it was Christmas, and I wasn’t going to knit it when I was around people, too complicated! So then I picked it up again in January, when I posted about the finished sleeve, and started the other. Which got under-way fine. 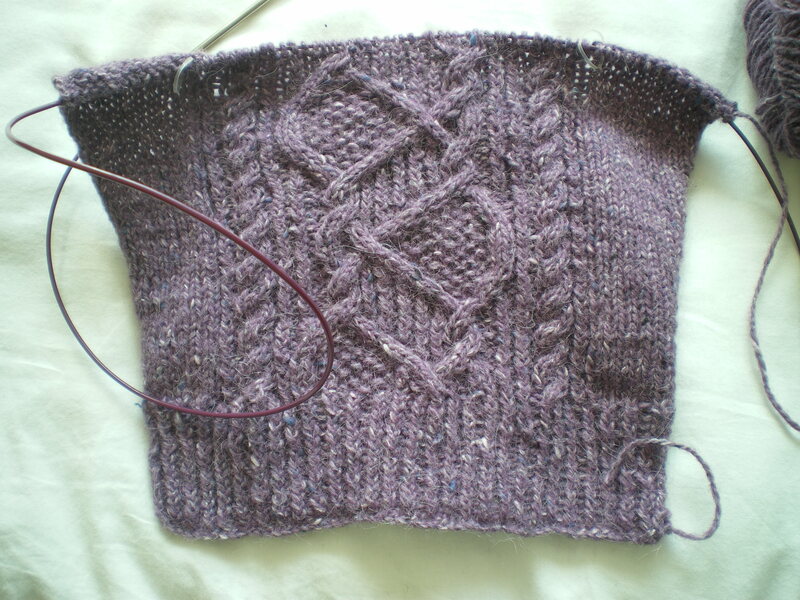 But then my little nagging voice at the back of my mind started saying something about how it felt a bit looser than the previous one… so I finished up the increases, and measured the cabled section against each other. 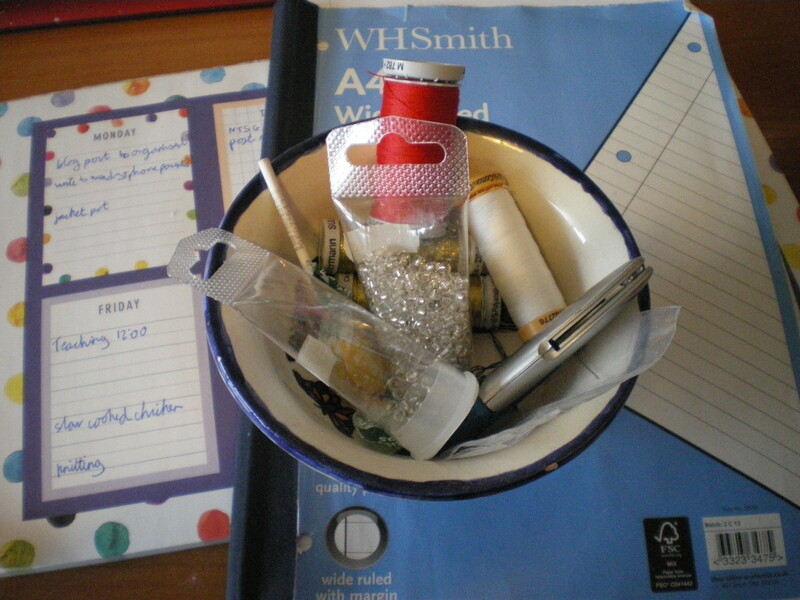 Yep, my gauge, somewhere, somewhen had changed. I was definitely looser than before. *sighs*. 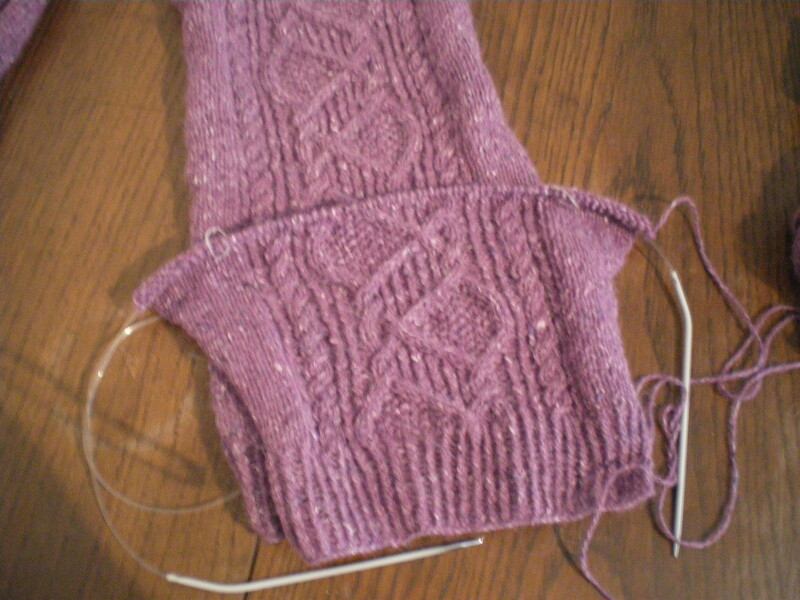 At this point, I was prepared to start the sleeve again, but cooler heads at my knittng club prevailed, and I worked on my socks for a while, until I felt better prepared to actually look at what was going on. It wasn’t the sleeve I was currently working on that had the faulty gauge… That sleeve had the same size for the cabled bit all the way through. So my first sleeve somehow got tighter part way through. No idea how that one happened, but ok. 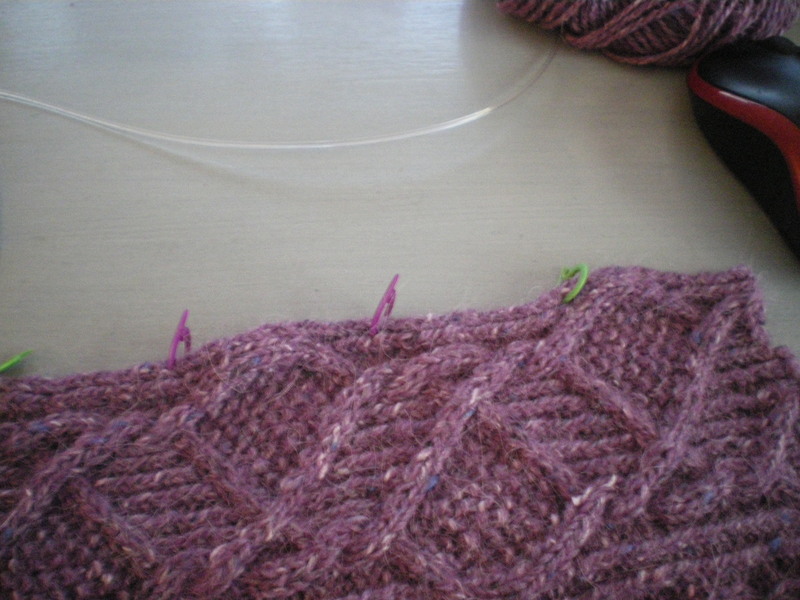 So, when I’ve finished this sleeve, I need to figure out where my tension changed, and frog back to there. Great. 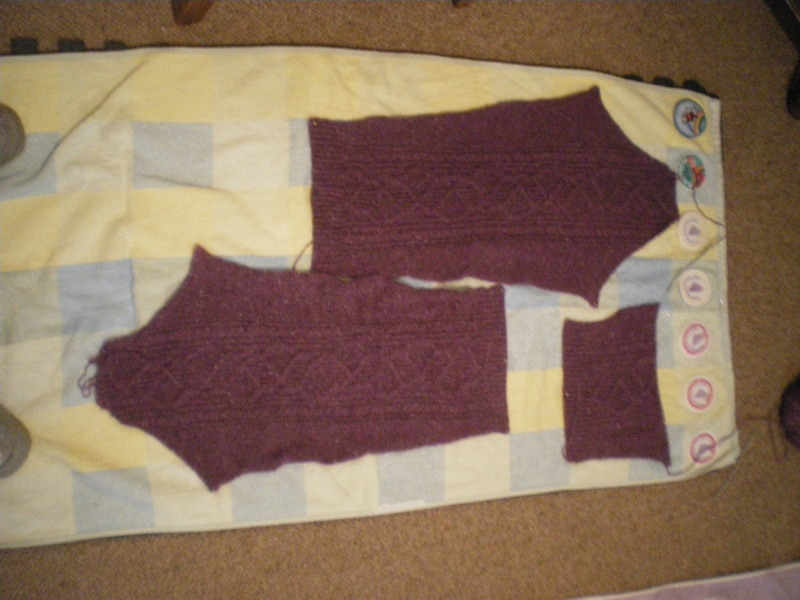 But, on the other hand, this second sleeve is nearly finished! Not a complete waste of a week! Well, it wouldn’t have been anyway, given all the networking that got done, but it’s still nice to think that I’ve gotten some crafting done, at least! This pattern is really nice (albeit I did find a couple of issues, but they’ve been sorted now) and I’m really looking forward to finishing this! I have, however, decided that I really need to get onto my dads mittens… I know they aren’t really needed till Autumn, but I’d quite like them to y’know, be done by then! So I’ve decided that I need to finish one mitten before I finish this sleeve… wish me luck here, I think I’m going to need it!